When deciding what kind of oxygen concentrator is best for you, it is important to determine what kind of oxygen delivery you would prefer: Pulse Dose or Continuous Flow. Pulse Dose (PD) is based on breathing and inhaling, whereas Continuous Flow (CF), as its name implies, is delivered at a constant rate indiscriminate of the user’s breathing. For continuous flow, think of it like a water fountain: If an individual stands in front of a water fountain flowing at 1 liter per minute, they don’t actually drink one full liter of water. The amount of water a person drinks is a product of the number of sips and the size of the sip. The rest of the water is wasted. The same applies to continuous flow oxygen; the net amount inspired is a combination of the flowrate, the number of breaths and the size of the breaths. Pulse Dose is more sophisticated. Pulse Dose mechanisms are more sensitive, utilizing an oxygen conserver and other technology to deliver oxygen based on breathing rates and other factors. PD is more akin to a glass of water with a straw than a fountain; the intake will be based purely on the amount and intensity of sips. When an oxygen concentrator is said to be a “single-solution” for on-the-go, at home, and sleep, it usually employs this type of technology so that it can deliver the proper amount of oxygen during all phases of daily activity and during rest. Based on this difference, it’s also important to consider how you’d like to use the oxygen: on the go, at home, or just for sleep. Pulse dose oxygen concentrators seem to be preferable for doing a number of different things, but continuous flow oxygen concentrators may be a sufficient option, particularly if breathing will remain relatively constant. 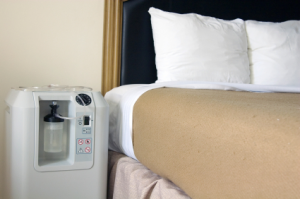 More logistical factors to consider are size, weight, and battery life of the oxygen concentrator. Think of your daily routines, and how adding this device might alter them, if at all. The final factor, of course, is consulting with your physician and health care provider to establish a plan that you are comfortable with.